Road BR-163, state of Pará, Brazilian Amazon. According to the definition in the Geography atlas, it is an area of “tropical rainforest climate, hot and humid”. However, it has been 120 days since a single raindrop last fell in the region. 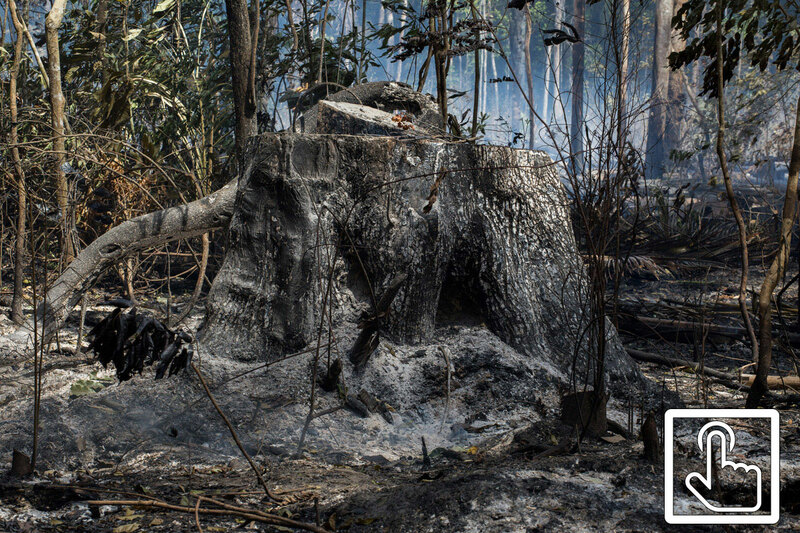 Amidst the 30-meter-tall chestnut trees, the path from Santarém, in Pará, to the Jamaraquá community, in the National Forest of Tapajós, is gradually taken by a strong scent of soot, that refers to a grayish area with remains of tree trunks which have recently been charred. For two weeks, the dissipated smoke invades the backyard of surrounding communities and takes over the houses of inhabitants. Reports of cough, stinging in the eyes and difficulty to breath become frequent. Days later, upon flying over the forest, we could see an even bigger dimension of the damage in it. 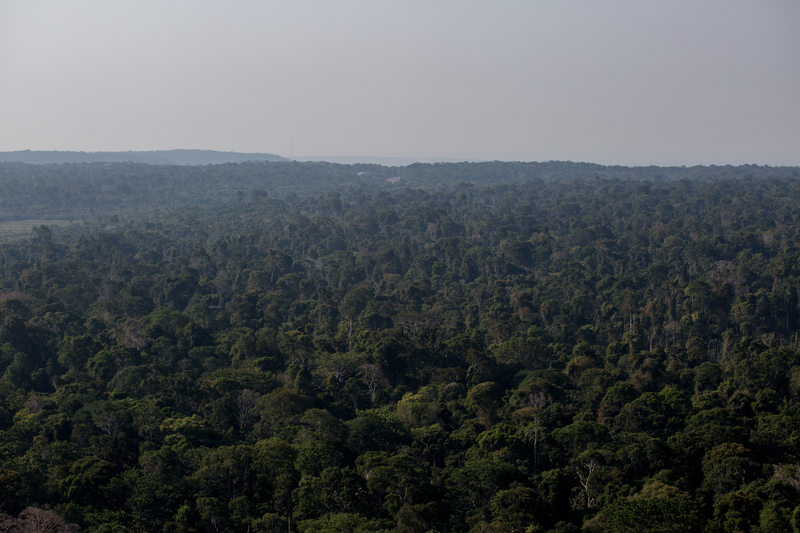 From the top, the National Forest (“Flona”) – with an area equivalent to 527 thousand soccer stadiums – looks like a vegetation island in a sea of soybean and cattle, which moves forward into the jungle year after year. 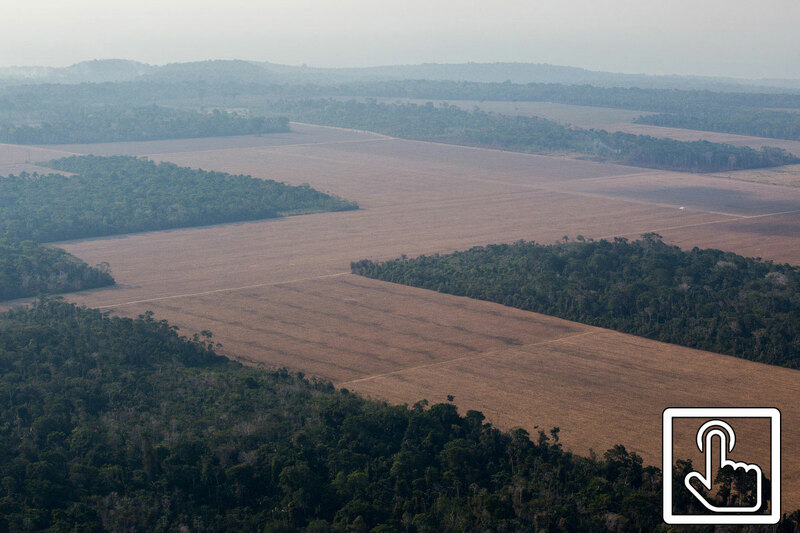 Since 1988, Pará is an undefeated leader in the region’s deforestation ranking, according to data from Prodes Project, from the National Institute of Spatial Researches (INPE). Only in the last year, the devastated area was of 282.62 square miles. 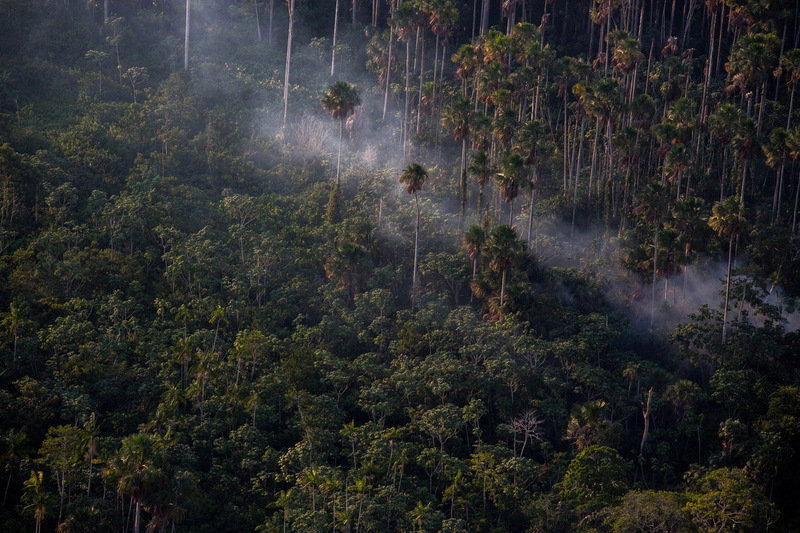 In the average, the last 40 years have had two thousand trees taken down by minute in the Amazon. During the flight, beyond the suppressed forest, another detail draws attention. The usual water steam morning mist in this portion of the Amazon is replaced by the dense smoke from the fire outbreaks. The natural evapotranspiration of the forest collaborates with the formation of the so-called “flying rivers”, which travel hundreds of thousands of miles through the airstreams, influencing in the humidity rates of the entire continent. The fire smoke, therefore, reaches the big cities from the North region. Instead of rainfalls, they dissipate carbon and methane dioxide. 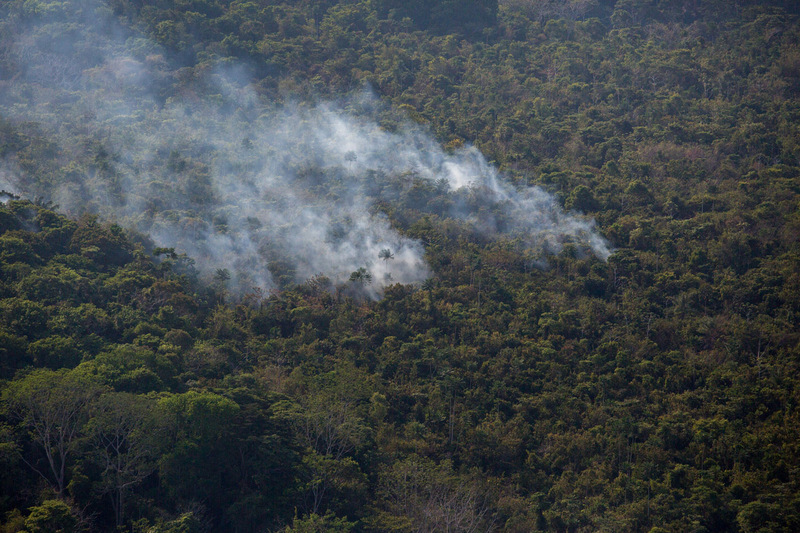 The fire is traditionally used in the Amazon as a cheap technique to open up pastures for the cattle or even areas of small cropping. 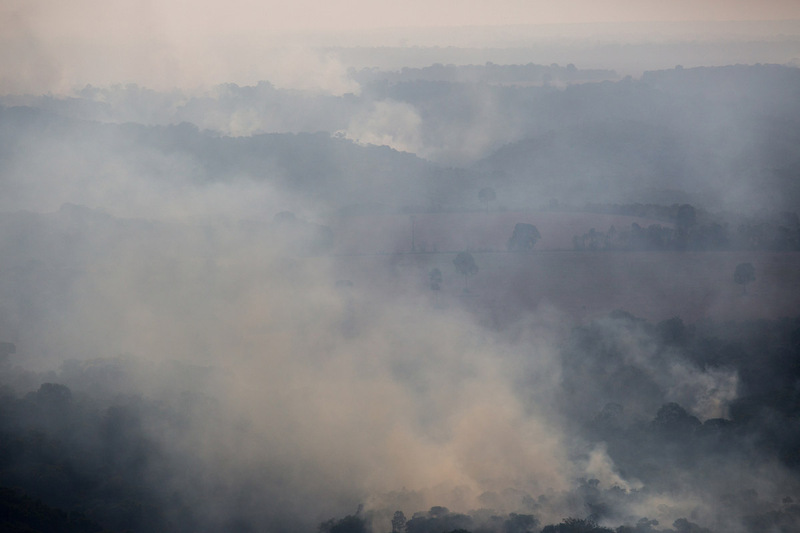 In the periods of drought, the flames easily spread, advancing over protected areas, such as the Tapajós National Forest (Flona Tapajós), leaving entire communities under the smoke, which spreads carbon monoxide and methane. In the last three months, according to the information from the local Fire Brigade, the municipality of Santarém (which borders with Flona Tapajós) has registered 350 fires. In order to provide a perspective, in conventional years, the annual average is usually around a thousand occurrences. “While we are attending one call, there are already four more waiting for us. 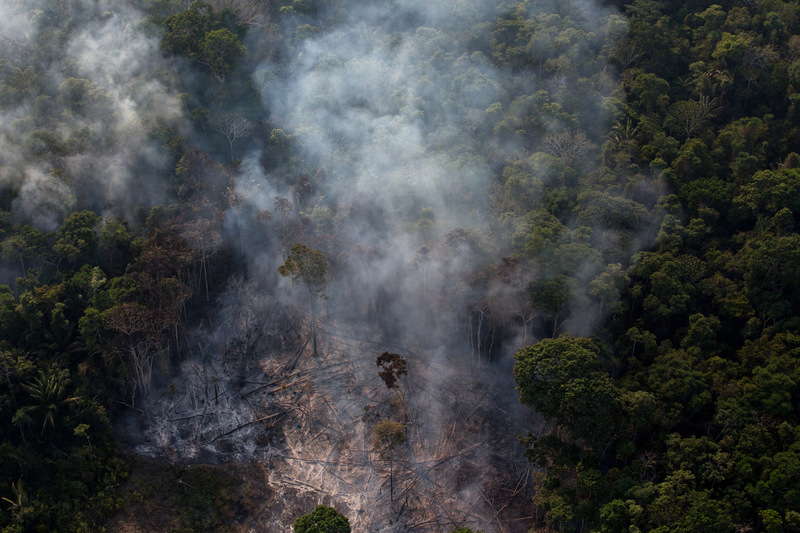 It is like that every day”, reports the Chico Mendes Institute (ICMBio) brigade commander, Giovane Oliveira, 25 years old, while opening up, with a strikes of a large knife, a path with about a mile that goes inside the forest, following the smoke trace. “I have never seen a situation like this during any other summer”. When the traces of flames finally get closer, the thermal feeling gives the impression of walking an open land of the caatinga. The sweat runs along the face and the team members scratch their red eyes. Most members are really young, but there are also older men, consequently, more vulnerable to the effects of the smoke. At one of the last calls, Antônio Mendes, 52 years old, lost control over the flames and had a stroke – and until the end of this report, he was still hospitalized in the Regional Hospital of the Lower Amazon, in Santarém, with no estimate of discharge or any diagnosis about the sequelae. At the health unit, his case adds up to about 180 more cases, only this year, of intoxication by smoke and worsening of respiratory diseases, such as asthma and bronchitis due to the poor quality of the air. The high incidence of fire, which triggers these cases, has three explanations: the fires used for the opening of pastures in the surrounding of the conservation unit, whose flames end up spreading; the fire used by the inhabitants themselves, in order to clean up cassava crops; and the natural fires associated to the extremely dry weather. According to the climatologist Júlio Tota, from the Federal University of the West of Pará (Ufopa), the causes are interconnected. “Changing the forest into pasture has a direct and immediate effect on the climate: the temperature increases and the rainfalls diminish”, states the scientist. The lack of rain, therefore, makes the weather drier and the forest more “flammable”. Since 1988, a tower installed by the Ufopa team in Jamaraquá ensures the monitoring of the humidity, pressure, temperature and other measures in six local communities. “They are important variables in order to understand how the forest interacts with the atmosphere in a long term basis, and the consequences for the formation of clouds and rainfalls”, says Júlio. Until now, among the effects of the climate’s changes in the region, losses in the ecosystem and in the biodiversity, higher quantity of extreme events, low river levels, favorable conditions for more fires and effect in the transportation of humidity for the south and southeast are indicated. While the meteorological researches try to relate the main causes of alteration of the temperature and rain intensity patterns, the Ecology professor of the Institute of Astronomy, Geophysics and Atmospheric Sciences from the University of São Paulo (USP), Patrícia Pinho, wants to understand the real impacts of the so-called extreme events in the life of the traditional communities: “When talking about the Amazon, it is common to bring up the carbon balance, the rich biodiversity and the biggest source of drinking water in the world, but we need to humanize our speech and remember that 30 million people live there”, says the researcher and author of the article “Complex socio-ecologic dynamics driven by extreme events in the Amazon”. 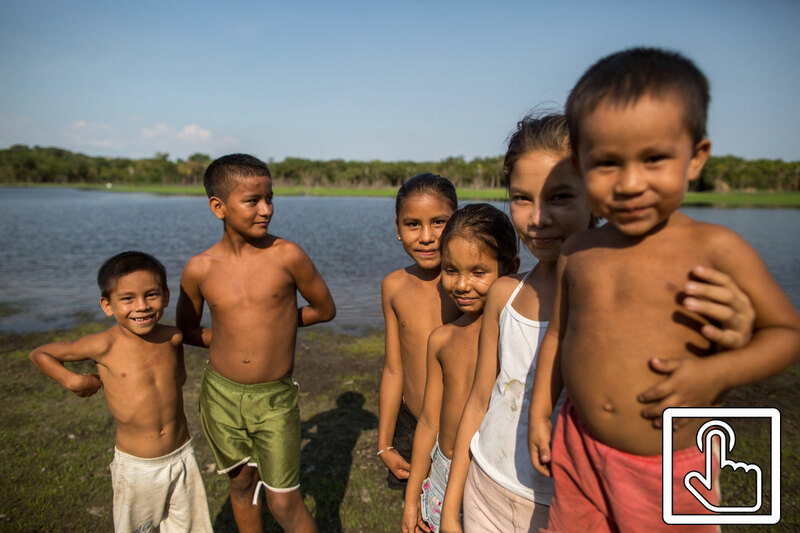 For the people who live in the countryside of the region, as well as for the inhabitants of the bay of the river Tapajós, it is the coming and going of the water that redesigns the landscapes, dictates the daily rhythm and demands different mechanisms of adaptation throughout the year. There are six months flood and six months of drought, when the water retreats up to 100 meters from the margin. The rainfall rate may vary from zero, in the months of September and October, to 700 millimeters in the month of March, in years of higher variability – as it was 2009, when a high flood was registered. 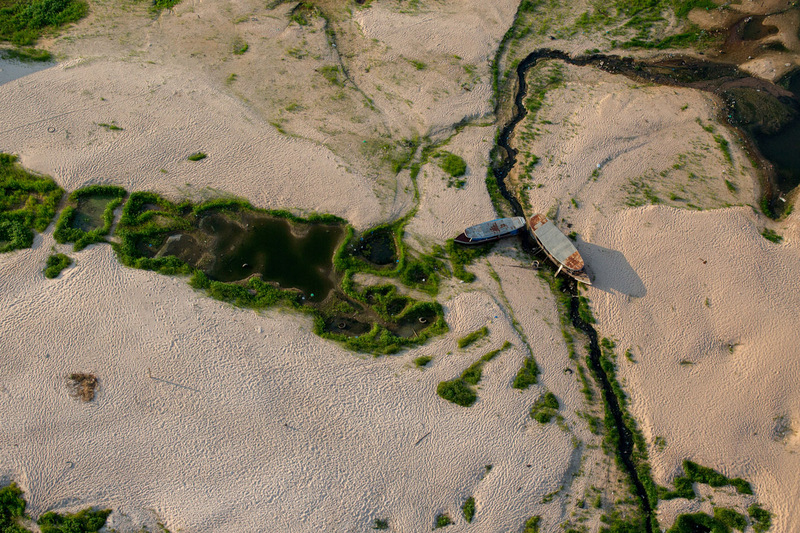 The extreme droughts increase the distances – complicating the access and the transportation of food – cause losses of crops and deteriorate the air’s quality. The floods turn the houses of the wetland communities in stilt houses islands. When the water increases more than expected, wood bases lift the furniture to heights each time closer to the ceiling. Small plantations are lifted and the domestic animals are taken to safety in safe lands. During that, many wild fish leave the riverbed and invade the flooded forest, which hinders fishing. The adaptation to the water dynamics is a reality for the riverside people, but the alterations in the landscape have brought new challenges. According to Paulo Brando, doctor in Ecology, from the Institute of Environmental Research of the Amazon (IPAM), in the last extended drought, in 2010, 57% of the Amazon Forest registered less rain than normal, imposing the need of new survival strategies in the region. 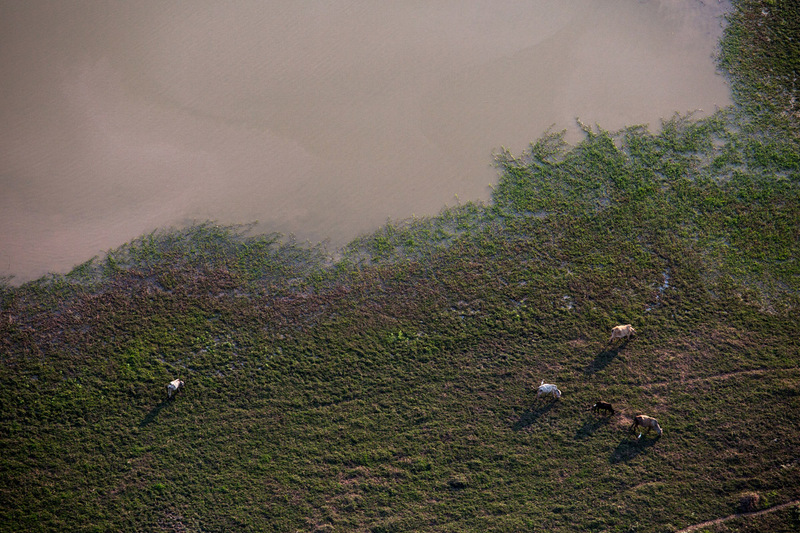 The drought reduced the rain in an area of 1.15 million square miles of the forest. In great municipalities, such as Porto Velho (RO) and Rio Branco (AC), the intense withdrawal of the rivers Madeira and Acre has led to the suspension of hydric supply: the capture system did not reach the water level. Still, there is not a more ascertained analysis about this year’s drought, which is still ongoing, but Patrícia Pinho’s evaluation is that the proportions are similar. In the communities of the Flona Tapajós, the isolation means more difficulties. 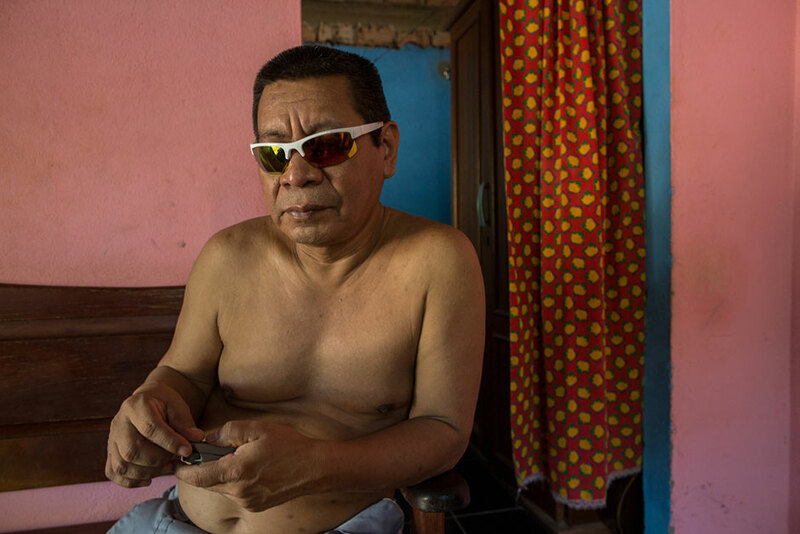 Known as “Mr.” Pedrinho, Pedro da Gama, from the village of Jamaraquá, is one forest inhabitants who feels that life is more difficult in comparison to when he was younger. “Each year is hotter. 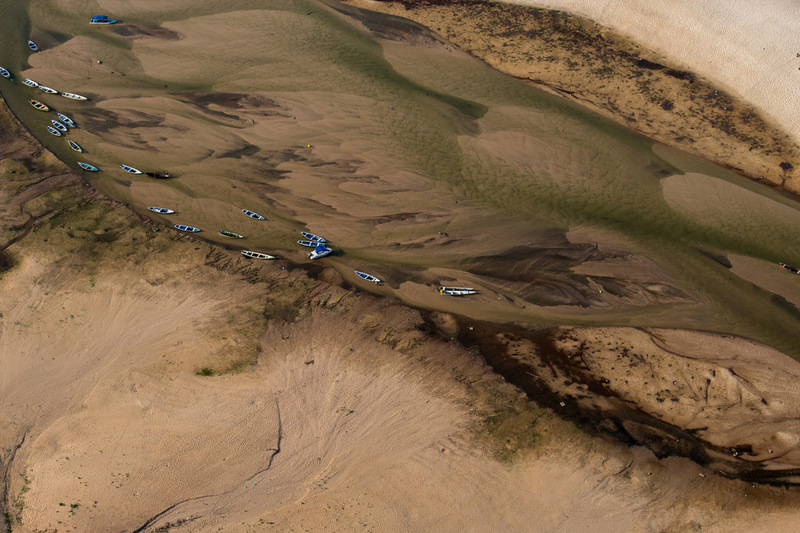 The river has less fish and, during winter, the land gets drier”. In shortage periods, he makes use of his entrepreneur spirit to invest in a community lodging as an income alternative. His business has been going well. In the traditional communities of the Flona Tapajós and Resex Arapinus-Tapajós, the riverside people make a living from the cassava plantation, from the fish (each time less frequent) and from the ecotourism, which ensures an income alternative in drier periods, when the crops do not resist. The simple structure covered with straw, with no walls and filled with hammocks, is located at the border of the river Tapajós. The refreshing igarapés in the woods, the golden sun that seems to melt over the rivers at the end of the day and the overnight stay with view to the starry sky at the border of the water ensure the movement in the community throughout the whole year. Ecotourists mean a safe source of income for “Mr.” Pedrinho’s family, and other inhabitants of the village lead the visitors through the woods for a daily fee of about US$ 25 – which is more than any other activity could provide in the forest. Although the ecotourism seems to be a way to improve the quality of life in the region, not all communities from Tapajós count with the same structure from Jamaraquá, which already has running water and electric power. In the Extractive Reserve (Resex) Tapajós-Arapinus, in the other side of the river, for example, the villages do not have access road, nor electric power, and a lot of them still have to take water straight from the river, because there are no supply systems. Between the Flona and Resex, there are a total of 103 communities, from which only six have continuous electric power and 65 have a water supply system. “The ones who depend only on the nature for providing to the family go through a lot of trouble, whether during flood or drought”, says Pedro da Gama. “The greatest part of the plants dies here, because the soil is very sandy. The ground runs hot and kills the trees, the cashew tree, the cupuaçu, and the locust berries tree”, completes “Mr.” Pedro. On the way to the river border, he shows preoccupation with the animals from the woods. “This drought makes a big change in their lives. The birds feel it, and so do the sloths. The latter falls to the floor and dies due to the lack of water”, states the caboclo, concluding a report that could have been made in the northeast semiarid environment. The riverside people that live in the Flona today already lived there before the creation of the protection area. With Indian ancestry, they survive through the growing of cassava, subsistence fishing or wood handling. 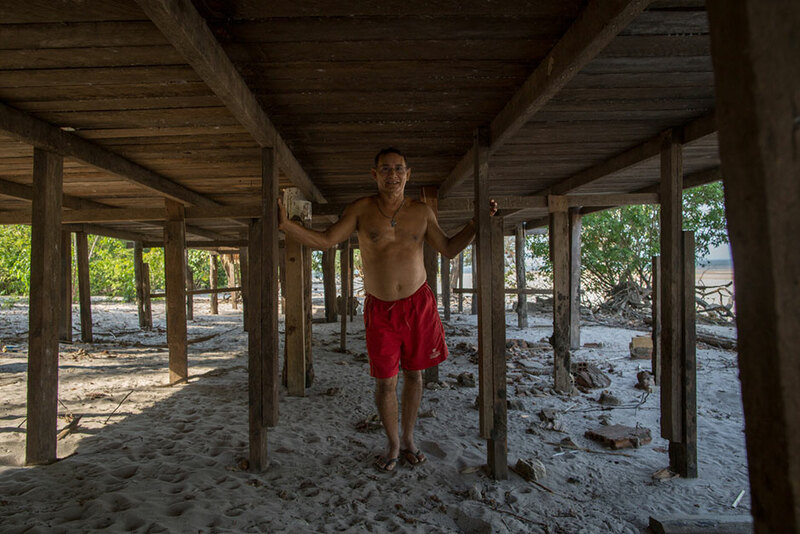 Inhabitant of the community of Jamaraquá, in the Tapajós Forest, he walks under the base of a “redário”, a wooden structure covered with straw that he built in order to receive the tourists in the community. During the droughts, the visitors sleep under the river’s fresh breeze: the water floods up to the first floor of the construction. During drought, however, there is almost a half-mile-walk to reach the margin. According to Pedro, it has been many years since the water last retreated like that. Fisher since he was young, the inhabitant of the Jamaraquá community states that the river is really bad for fishing. 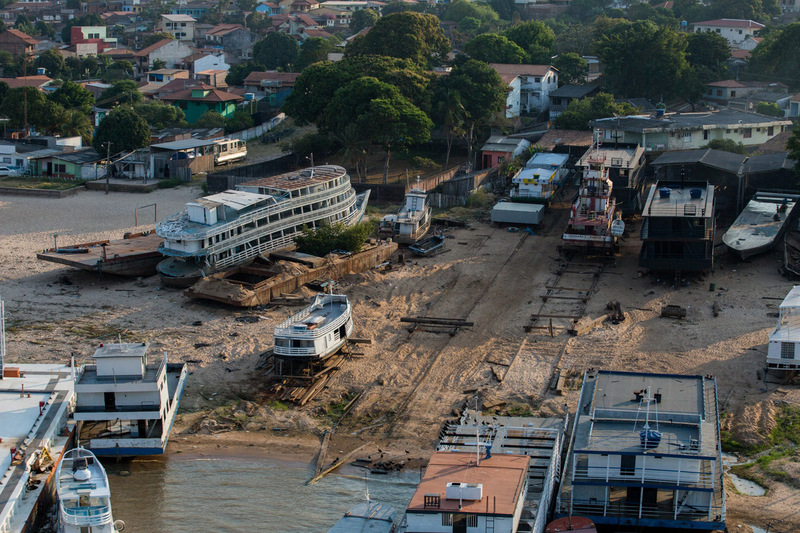 In his opinion, it is not worth it to spend a day in the river, because Tapajós is severely damaged by commercial fishing, which makes trawl fishing in the river, taking about 30 tons of fish in every passage in it. With no conditions to provide for his family with small-scale fishing, today, an alternative for Rui is to work as a tourist guide, taking the visitors to meet the forest trails. He prefers to buy fish in the city’s markets. According to Edinelson, there is drought every year, but sometimes it is worse, such as in 2015, in which the fruits are drying in the trees before they ripen. Another drama is the lack of forecast as to know when it will be possible to plant the cassava crops. In November, they should have already been planted, but with 120 days of drought in a row, whoever planted them has lost their work, because, according to him, the root dies underneath the earth. The delay in the cropping may leave some families without flour, one of the main ingredients of the riverside people’s diet. 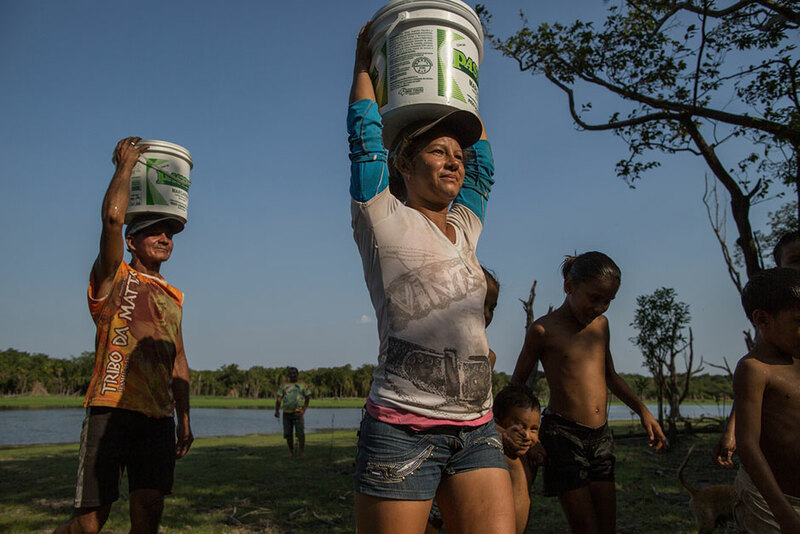 Inhabitant of the community of Maripá, in the Resex Tapajós-Arapinus, she walks up to 8 times a day in order to bring buckets of water from the nearest lake to her house, but the water is so dirty that it is not good for human consumption. In order to drink, she has to go to her neighbor’s house, which has an artesian well, and ask for water. So as to take a shower, she needs to take the water home and wait for it to cool down at night, because it is too hot in the lake. “If you are going to take a shower here, you will burn”. 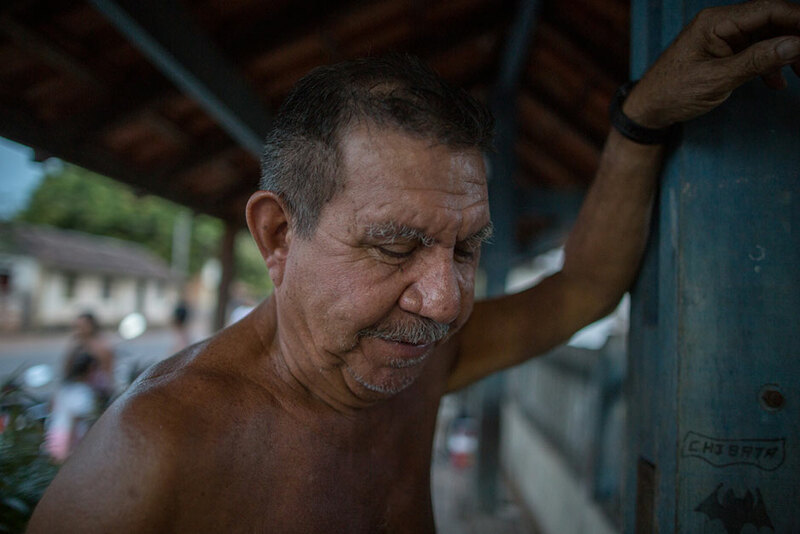 Inhabitant of Alter do Chão, he fishes since he was a kid and deeply knows the dynamic of the ups and downs of the Tapajós River, the most abundant species and the best time for fishing. The intimacy makes Alfredo accurately calculate the risks and challenges of fishing. He does not believe in superstitions, but he has already gone through some serious trouble that he cannot explain. One night, while he sailed in the river, he had his canoe lifted by something he could not identify. Other inhabitants associate the deed to the “big snake”, a haunting that would live in the river. In order to protect himself from troubles and bad omens from the river – such as big waves, unknown creatures that “turn boats over” and other challenges faced by great navigations in the Tapajós – the fishers appeal to curators, such as José Silva, that gives blessings and protection and promises cures to diseases. However, in Patrícia Pinho’s evaluation, the great climatic variability is creating each time more hostile life conditions in regards to housing, hydric safety, health and transportation. According to her, the 2005, 2010 and already the 2015 droughts, as well as the severe floods from 2006 and 2009, seem to have exceeded the confrontation capacity of the communities. The researcher and doctor in Geosciences by the Oswaldo Cruz Foundation (Fiocruz), Christovam Barcellos, highlights that this is a reality that may get worse with the increase of the temperature expected by the region’s climatic models. The trend, as it is known, is global. The Intergovernmental Panel about the Climate Change (IPCC) indicates that the temperature will continue to increase, and until 2050, the global average will be up to two degrees higher than the current one, depending on the quantity of issued greenhouse gases. According to the World Meteorological Organization (WMO), 2015 was the hottest year registered since the onset of the monitoring, in 1880. Still according to the WMO’s report, the surface’s average temperature may surpass the symbolic barrier of 1ºC of heating since the pre-industrial era (1880-1899). 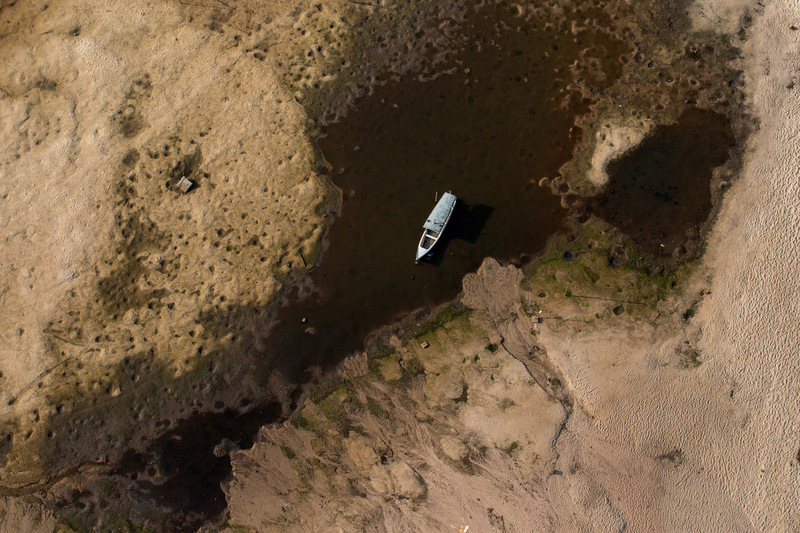 The study attributes 2015’s record to the El Niño phenomenon (unusual heating of Pacific waters), whose occurrence intervals have coincided with the extreme drought periods in the Amazon. The explanation is that the formation of hot water sea currents causes the alteration in the conditions of wind and transportation of humidity from the oceans to the continent. That is, besides the patterns of microclimate influenced by the deforestation, the region also suffers the world climatic anomalies. For Patrícia Pinho, however, “a change is necessary on the models of evaluation at the local scale. They still do not understand the nuances of the reality in these places”. What are the main occurrences of health problems that may be related to the extreme climatic events? “Part of the respiratory diseases can be attributed to the low humidity and the bad quality of the air. Now the diseases transmitted by varmint, such as dengue or malaria, are caused by the water contamination during the floods event”, states Christovam Barcellos, from Fiocruz. The period known as “floods” is not only related to the river levels, but also to the excess of rain which triggers the accumulation of still water – where the mosquito aedes aegypti proliferates, implying in the growth of dengue cases. At the scientist’s point of view, the solution to diminish the impact of the climatic changes in people’s health is to avoid fires. 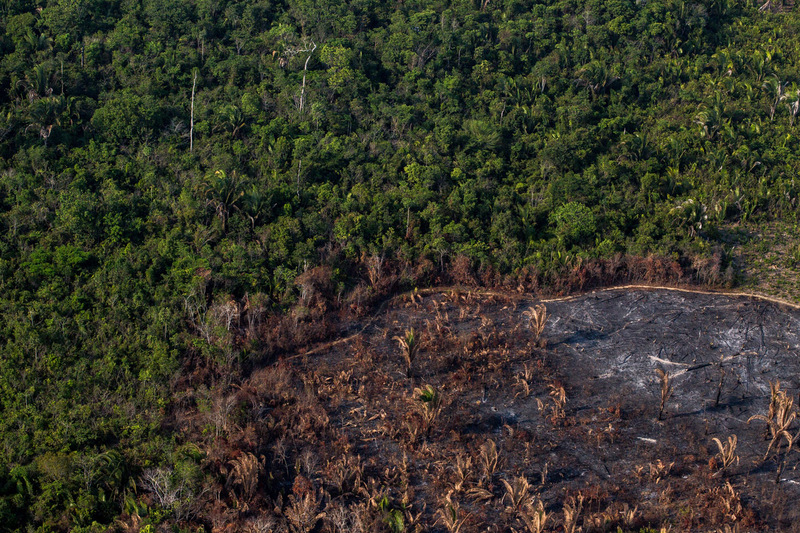 “The fire, the smoke and the soot in the Amazon must be stopped once and for all. We already have enough technology with satellite monitoring in order to identify the fire outbreaks, and even map the fires that happen in areas of environmental protection. It is no use to only know where they are happening, we have to patrol these areas and prevent the disasters that are repeated every year”, he analyzes. Darlison Andrade, analyst of ICMBio, body that manages the Brazilian conservation units, shares Christovam’s concern. 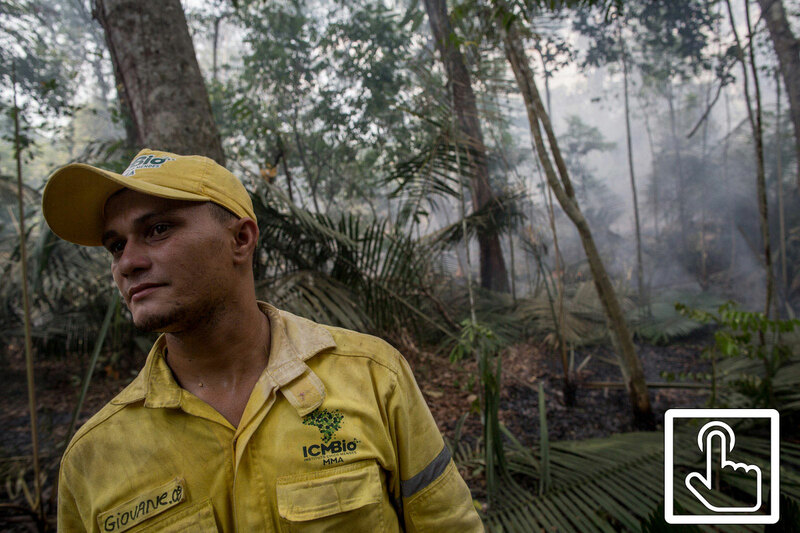 According to him, the Amazon conservation units literally live in a fire enclosure, since the environmental body does not have the competence to inspect the surroundings of the protected areas, where the fires start. The fire proliferation is only one of the effects of the abrupt or extended droughts that also interfere in the community’s transportation, fishing and crops. In Jamaraquá, the cassava used for flour, main carbohydrate in the riverside people’s diet, is drying underneath the earth. Ari, inhabitant of the region, shows that he tried to plant some cassava with the help of the rain, which did not fall: “Whoever planted it, lost it, because it will not work. At this time, everything should have already been grown, but we have to wait for the time it starts raining in order to work with the earth. And the harvesting will also be delayed. One who does not have a stock will have to buy it”. Antônio Nobre, doctor in biogeochemistry from INPE, believes that this type of situation highlights the need of immediate action. 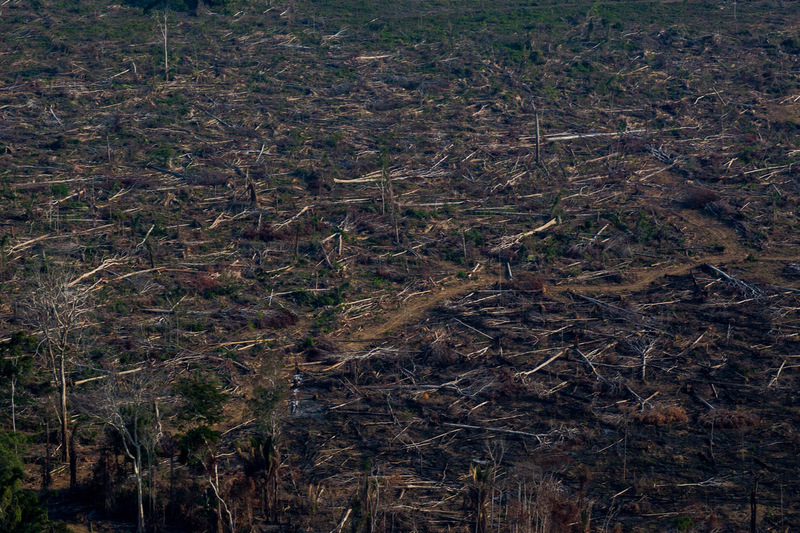 According to him, even though the studies that relate deforestation and the climatic events are ongoing, an action has to be taken now in order to avoid greater damage. “In science, we are trying to develop some knowledge in order to understand. The native people are not doing this. They already had this perception. The Amazon Indians spoke like this: ‘does the white man know that if he takes out the forest, the rain will stop and if the rain stops, we will not have what to drink and eat?’. They already know this. We had to take it out to realize that the rain stopped, and now we are learning and saying: ‘we need to put the forest back’”. 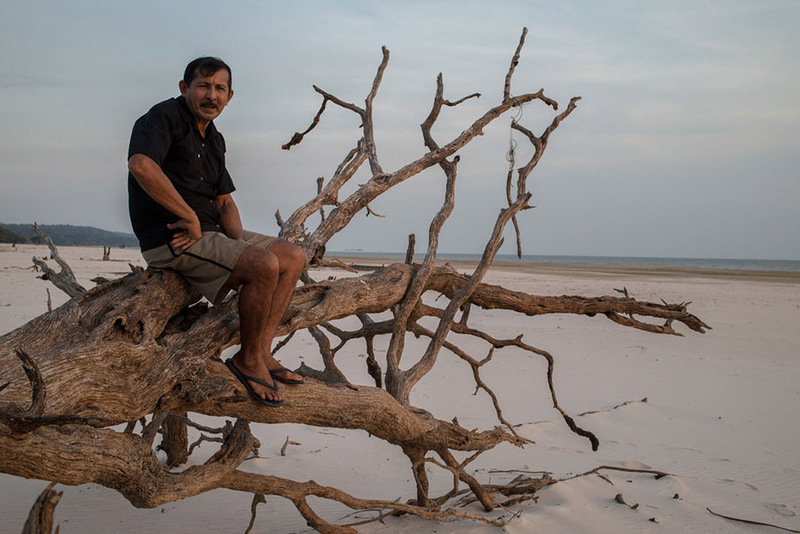 Pedrinho’s guests, in Jamaraquá, do not even imagine it, but the fish served with cassava under the shadow of the leafy tree in the river’s margin, may be in its final days: the river is so bad for fish, that the caboclos are giving up on their fishing activity. They prefer to buy meat in the city than to spend an entire morning in the canoe, in order to guarantee their lunch. “In the lakes, it is even worse. The water is still and it is so hot that not even the fish survive”, tells the young man Ildo Santos, 24 years old. While leading us through a trail in the middle of the woods, the inhabitant explains that, actually, most lakes in the community dry up completely during winter. The problem is that, this year, many disappeared before expected, causing the death of fish, which could have been used by the population. “Every year, before October arrives, we come here and get the fish in order to store them, but this year it was too fast, and when we arrived here, in September, everything had already died”, remembers Ildo, while walking at what should be the bottom of a lake. 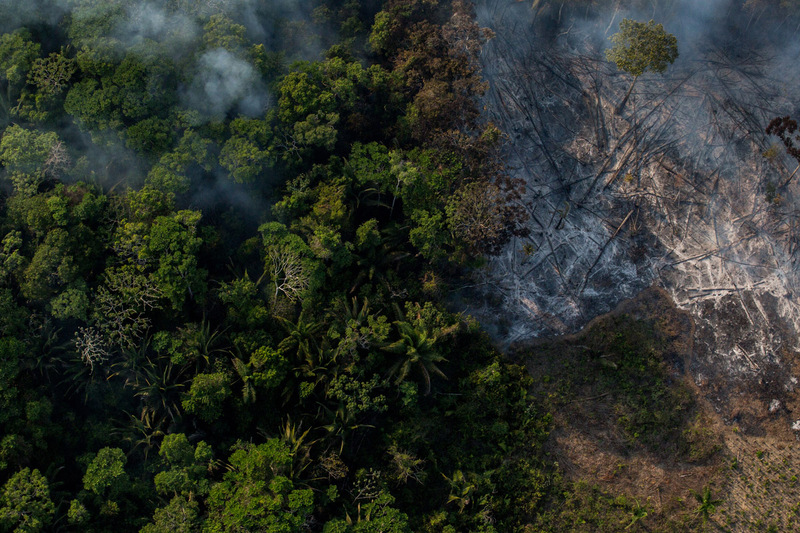 For Patrícia Pinho, the change in the pattern of the climatic events causes this lack of predictability, creating an uncertain feeling in the inhabitants about the ecological system that governs the Amazon. With the sudden alterations in the rainfall regime, the riverside people do not know exactly when to plant anymore, nor the best time for fishing or how much flour they have to stock to prevent unpredictability. The researcher highlights that the effects of the climatic extremes are worsened by anthropic actions, such as predatory fishing. Although the National Forest of Tapajós is an environmental preservation unit, the Tapajós River, which names the forest, is not part of the protection area. Scenes near the harbor of Santarém and in the wetland areas near the municipality. 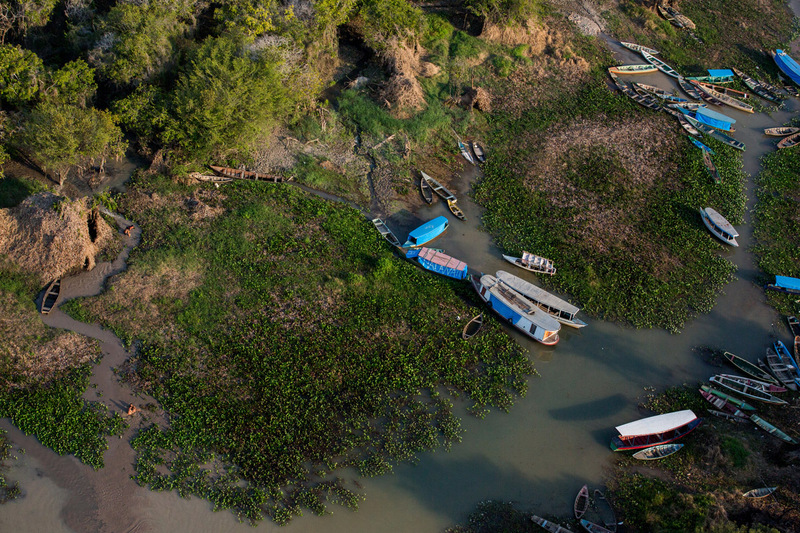 With the out-of-pattern droughts, the low level of the rivers causes risks of wrecking, hinders the transportation and increases the distances from already isolated communities, which mainly depend on the navigation in order to move around. 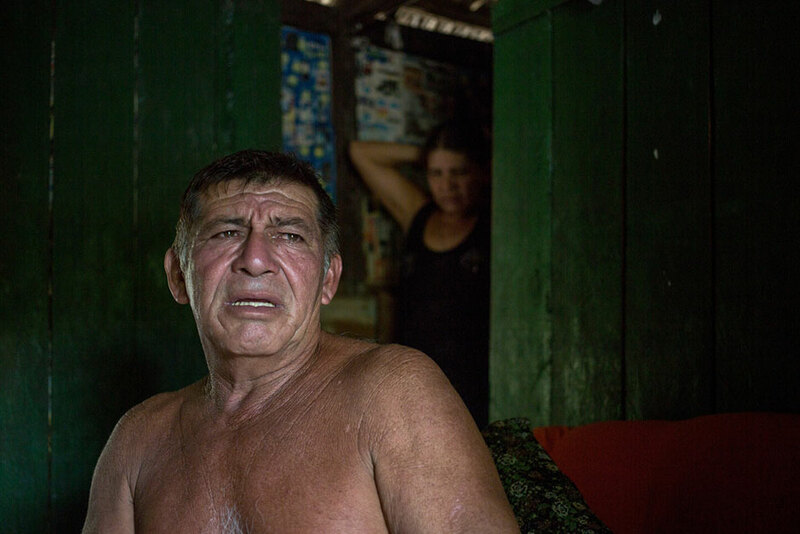 Edinelson Fonseca, 62 years old, was born and raised in Jamaraquá. While he watches the river from far away, sitting on the beach, he tells with a nostalgic tone about the times of fresher temperature, fuller fruit trees and fish-filled rivers. “Today, the fish in the lake is dying because of the hot water. In order to fish here in the river, one has to stay the entire morning to catch a cichla. And sometimes, one does not even catch it. The big boats that come from Belém take everything. They come with a fine mesh net and do trawl fishing, taking everything in front of them”, explains the inhabitants (learn more in the box below). The reports eco through all of the communities, building a portrait of a forest that, besides having its woods burning with flames, agonizes with empty rivers. 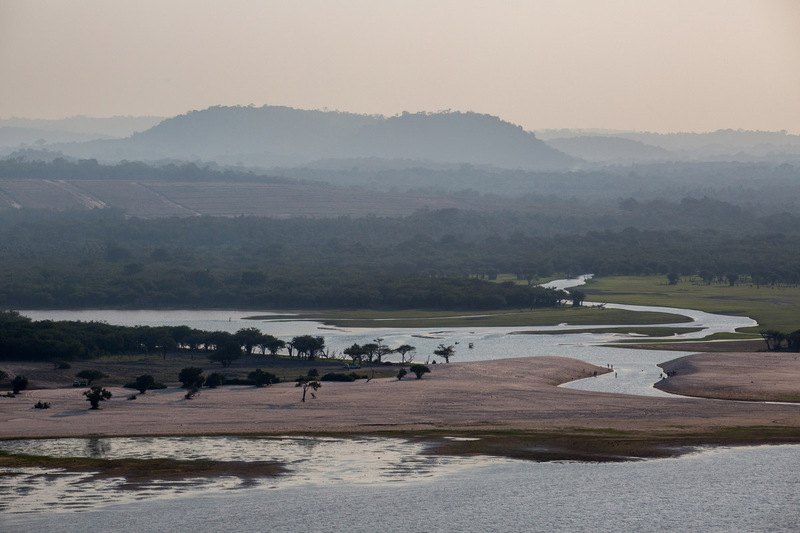 For Antônio Nobre, it is time to mobilize a war effort in order to protect a unique and irreplaceable place for the planet, that took 50 million years to come to shape. 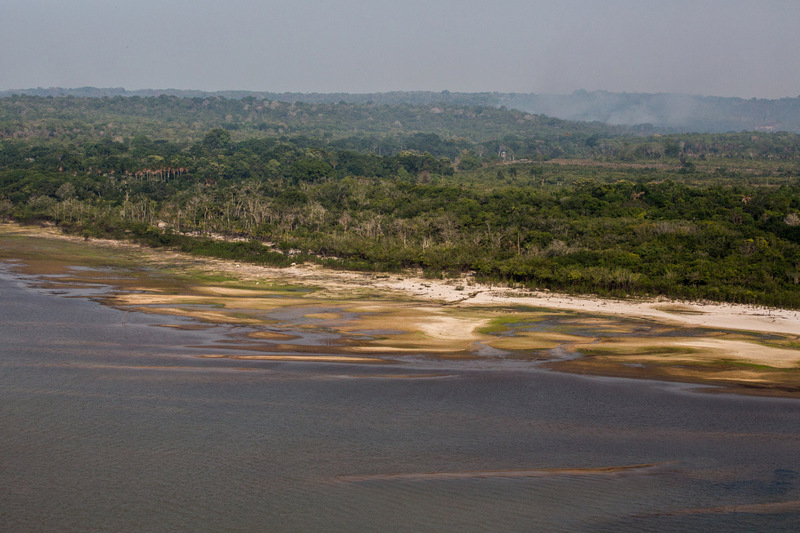 The Tapajós River baptizes two protected areas in Pará: the Tapajós National Forest and the Extractive Reserve Tapajós-Arapinus, which is located in the opposite margin of the river. The river itself, however, is not protected by any of these two units. The lack of protection gives a breach for commercial fishing activity in great boats, known as “geleiras”, which may take up to 30 tons of fish. The activity, according to local inhabitants, has been leaving the river out of fish. Many have given up on fishing, preferring to buy fish or other kinds of meat in the city’s markets. According to Patrícia Pinho, in the region, it is common to replace fish for low quality frozen chicken, which presents contamination risk due to the freezing and thawing process in communities with no electric power. Since the river is not included in the environmental protection areas, the commercial fishing is not irregular. 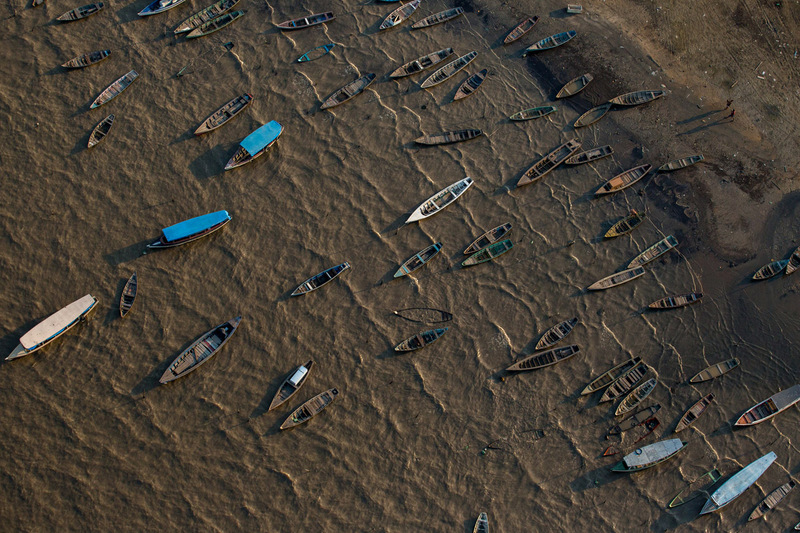 The problem, according to inhabitants, is that the boats from Belém and other places perform the so-called trawl fishing (when two vessels tie a net among them in order to take all fish in any size), which is forbidden in Pará since 1994. Reportagem do InfoAmazonia publicada por uma equipe dedicada em fevereiro de 2016 e financiada pela Earth Journalism Network. Todo o conteúdo está disponível na licença Creative Commons BY-SA 4.0.